Amid turmoil in the Middle East and changes in world leadership, much has been made of Egypt’s stability, but already in 2017 we have seen how much of this is illusory, with terrorism, sectarianism, and social and economic upheaval rampant, and legal and constitutional concerns remain. 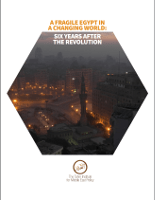 “A Fragile Egypt in a Changing World” explores the issues facing Egypt, taking a deep dive into the events of 2016 through a summary, background, and analysis, and presenting recommendations for Egyptian and international policymakers to address these concerns. The issues Egypt faces are not, as some observers claim, outcomes of its uprising in 2011, but rather symptoms of the longstanding problems and challenges that caused it and have remained unaddressed. Indeed, many of these concerns have already shown their persistence into 2017. The patterns of the first five post-revolutionary years—as documented in our report “Unmet Demands, Tenuous Stability”—have continued through the sixth year after the revolution and into the seventh. “A Fragile Egypt in a Changing World” addresses misconceptions to assert that Egypt’s security and stability are not mutually exclusive to the support for human rights and freedoms demanded in January 2011. The report examines all aspects of governance in Egypt: political engagement, rule of law, rights and freedoms, minority rights, gender equality, security, and economic stability to explain how it arrived at its current state and provides recommendations for how to move toward fulfillment of the revolution’s aspirations in the current political context. The recommendations, of course, are not a panacea; rather, they are a starting point, the bare minimum that must be done to address the issues Egyptians continue to face. This report is based on the findings of long-term research projects conducted at the Tahrir Institute for Middle East Policy. Our research strategy follows a systematic process of data gathering, documentation, and analysis, upon which we formulate our advocacy positions. We begin our research with thorough documentation, as volatile situations and changing governments and rulers in Egypt have caused many political factions to attempt to cast recent history in their own terms. Per TIMEP’s mission, we are committed to highlighting local voices and understanding internal dynamics and nuance; thus, all our work is conducted in close collaboration with local analysts, researchers, journalists, and civil society actors.